At a time when artist-run spaces were a dynamic part of the local art scene in the 1980s, UQ Art Museum Associate Director (Curatorial) Michele Helmrich was embarking on an Honours Thesis that would lead her to explore two groups of young Brisbane writers and artists in the 1940s, Barjai and Miya Studio – currently the focus of an exhibition showing on Level 3 of UQ Art Museum. We asked Michele what originally piqued her interest in this moment in Brisbane’s art history and about the people behind it. Q: What prompted the writers and artists of the Barjai and Miya Studio to establish these initiatives and can you provide an insight into the broader social and historical context? A: The Pacific war brought a sense of urgency to Brisbane. Generals MacArthur and Blamey based their northern operations in Brisbane for a time and tens of thousands of American and Allied troops passed through the city, artists and poets among them. Imbibing this energy, Brisbane State High School students formed Barjai magazine in 1943, adopting an Aboriginal word for ‘meeting place’ as the title. Co-edited by Barrie (Barrett) Reid and Laurence Collinson, Barjai went national in 1944 and in 1945 presented itself as a quarterly literature and art ‘magazine of creative youth’; contributors were to be up to 21 years of age. In its pages they strove to create a ‘Brave New Post-War World’. A local counterpart was found in the magazine Meanjin Papers, based in Brisbane until 1945 and edited by Clem Christesen. The poet Judith Wright, whose work was published in Meanjin’s pages, was a source of inspiration for Barjai’s writers. Collinson, Reid, Barbara Patterson (later Blackman), Cecel Knopke and Vida Smith (later Horn) were actively involved in producing Barjai, with Dr J.V. Duhig generous in his financial support. The young artists who broke away from the Younger Artists’ Group of the Royal Queensland Art Society (RQAS) in late 1945 to start Miya Studio also sought to ground their art in the ideas and concerns of their time – ‘Miya’ was an Aboriginal word for ‘today’. As Miya Studio co-founder Laurence Collinson stated, the local artists were ‘working with their eyes closed’. Set up as a cooperative studio for younger artists, Miya Studio offered studio space and the opportunity to include work in annual exhibitions, five of which were held in different venues between late 1945 and 1949. Their main studio locations were ‘Alexandra’ on Wickham Terrace and later the attic of the School of Arts in Ann Street. In some part their studio offered a youthful alternative to the drawing classes of the RQAS in Harris Court or Caroline Barker’s city studio, while a more radical, and socialist, model was the Studio of Realist Art (SORA) in Sydney, with which Collinson – who became a member of the Communist Party – was familiar. Q: What role did art historian Dr Gertrude Langer have in supporting and influencing Miya Studio? A: Dr Gertrude Langer and her architect husband Dr Karl Langer arrived in Brisbane as refugees from Vienna in 1939. A trained art historian, Gertrude Langer was keenly sought after by the young Miya Studio artists, who attended her History of Art lectures. Collinson, Laurence Hope, Pamela Seeman (later Crawford) and Joy Roggenkamp (later McCowan; Joy was then a school girl) attended her lectures and sometimes visited her home in Toowong. Through her they learned of the early twentieth-century European avant-garde and saw the potential of what could be achieved in their local art scene. Gertrude Langer also lent her support through opening the first two Miya Studio exhibitions and, when Barjai and Miya Studio held a series of ten public lectures in 1946, she delivered the first on ‘The Philosophy in Chinese Art’. 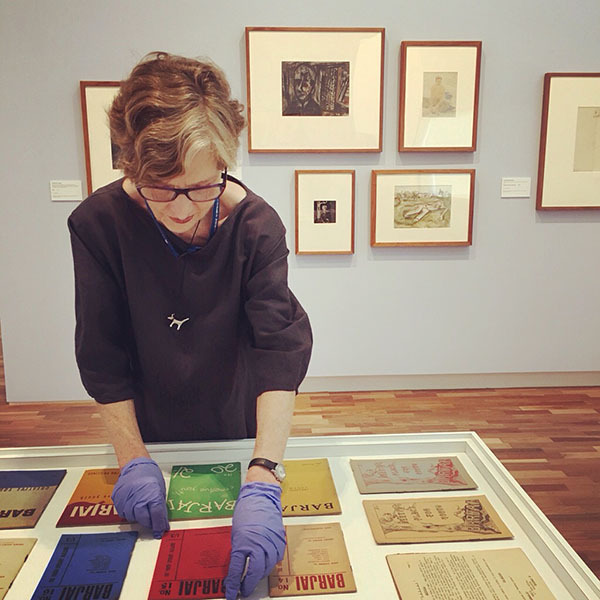 While Gertrude and Karl Langer had brought their library to Brisbane, young artists could also access books on modern art at the Art Reference Library, which Daphne Mayo and the Queensland Art Fund had founded in 1936, assisted by The Carnegie Foundation in New York. Q: While headquartered in Brisbane, the engagement and reach of Barjai and Miya Studio extended far beyond the city limits – can you tell us a bit more about the circles the key members of these groups were moving within at the time? A: Barjai Groups had appeared in other cities in 1944, with contacts including Brian Medlin in Adelaide and Grace Perry in Sydney, both then in their teens. Reid and Collinson published poetry in interstate literary magazines and recommended Angry Penguins and A Comment to their readers. In an endeavour to increase interstate contributors, Reid and Hope hitchhiked to Adelaide and Melbourne over December 1946/January 1947. In Melbourne they visited Murrumbeena pottery and met Arthur Boyd and John Perceval, and the patrons John and Sunday Reed at Heide, where Sidney Nolan was painting his Ned Kelly series. Joy Hester, also at Heide, gave Reid her drawing Gethsemene V. This was a deeply formative experience for Reid and Hope, with Reid later stating that at Heide he ‘saw real painting, free and authentic, for the first time’. Nolan associated with Reid and Hope when he came up to Brisbane in late 1947; Reid took Nolan to Fraser Island, Nolan utilised the Studio and included work in the 1948 Miya Studio exhibition, adopted Reid and Charles Osborne’s Ballad Bookshop as his base, painted with Joy Roggenkamp in North Queensland, and exhibited his Eliza Fraser paintings at the Moreton Galleries in February 1948. But by 1947 Barjai had closed at its final 23rd issue, Barbara Patterson editing these last pages. Her future husband, Charles Blackman, was one of a number of interstate artists who associated and/or exhibited with Miya Studio, others including Shirley Keene, Louis James and John Yule. Blackman and Hope admired each other’s work and struck up a friendship, travelling together to Melbourne in 1949. Q: You undertook your Honours thesis on Barjai and the Miya Studio – what inspired you to investigate these artist-run spaces and can you tell us about your fortuitous meeting with Pamela Seeman? A: I undertook my Honours thesis at UQ in the 1980s, a time when artist-run spaces were a dynamic part of the local art scene. When looking for a thesis topic, I noted one paragraph in Richard Haese’s book of 1981, Rebels and precursors: The revolutionary years of Australian art. Haese spoke of ‘this small but vital group of young artists and writers [who] had coalesced around the magazine Barjai and the Miya Studio’, describing Barjai as ‘a kind of youthful Angry Penguins’ (page 148). UQ’s Fryer Library held copies of Barjai and my supervisor Nancy Underhill helped me begin to locate people who had been linked to these groups, which then led me to interview and receive letters from a number of the artists and writers, and track down a wealth of other material. The turning point came when I had the good fortune to meet Pamela Crawford (née Seeman), who lived on Mount Tamborine. Pamela had been the secretary of Miya Studio and had kept records of their activities, as well as extensive ephemera and all the artworks that had been left in the studio. After completing my Honours thesis and when curating the exhibition Young Turks and Battle Lines: Barjai and Miya Studio for UQ in 1988, Pamela gave the majority of these works to the UQ Art Collection. More came to the Collection from her estate in 1997. This material now constitutes The Miya Studio Archive, while Pamela Crawford’s papers are also held in the Jim Crawford Collection in Fryer Library. One of the artists whom I met as an Honours student and whose work of this period I have particularly admired was Laurence Hope. An exhibition of his work, curated by Walter Granek, was developed and toured by the UQ Art Museum in 2002. This current exhibition is dedicated to Laurence, who died earlier this year in London. Barjai and Miya Studio is showing at UQ Art Museum until 24 July 2016. Tags: 1940s, Artist Run Initiative, Australian Art, Barjai and Miya Studio, Brisbane Art History, Interview. Bookmark the permalink.